Mai is very beautiful she has an innocent rare beauty, her face is slightly heart shaped and she has a Slightly cool cream skin colour that turns a peach pink around her cheeks in the warmth of the sun. Covering her forehead and tumbling down the middle of her back in soft waves, Her hair Is of a chestnut colour which has a sort of brownish-red undertone and at the tips lighten only slightly. On her face are a pair of caring and slightly feral forest green eyes which seem to fade into a jade green, Her nose was small and with a rounded tip her lips were small but full and a pinkish-cream. Mai's body is of the slim and curvaceous type, Her breast are a 38C and are still growing, every two weeks she seems to need a new bra. Her stomach is flat and toned beautifully, Nipping in at the waist and being just a little thick in the thigh and buttocks area her legs are perfectly sculpted and smooth. Small and petite describe her feet which are almost always dirty underneath since she really does not like wearing anything on them. Clothing: Mai's preference of clothing is usual something light and airy. 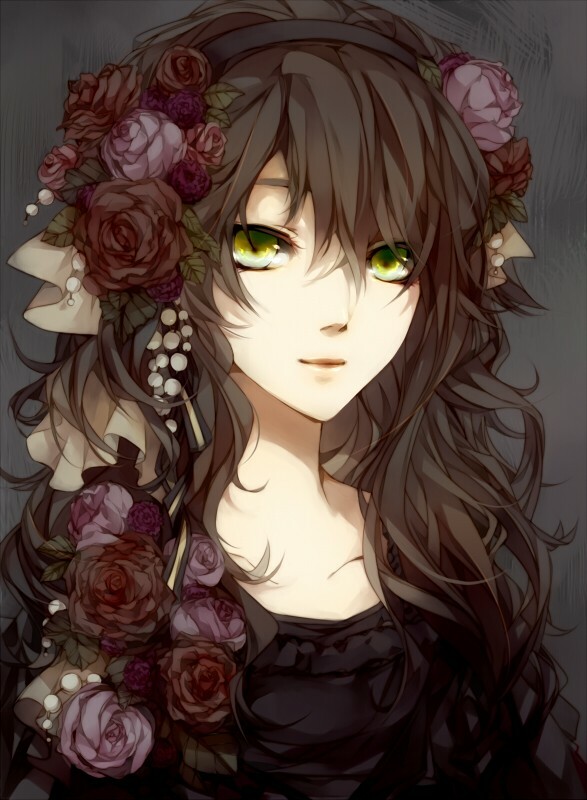 She always wears her fresh flowered head band that consist of flowers she grows and picks herself, the flowers serve a dual purpose, Along with looking elegantly beautiful in her hair she uses the flowers for a weapons and as a medical healing use. Her choice of colours are usualy dark browns,pastels,and a lot of earth colours. When in the world of the living she wears a short black ruffled skirt and a black tank top, on her feet ( much to her dislike ) she wears black flats that fit like ballerina slippers and tie up around the leg like them.On her relaxed time she is usually seen wearing a kimono with floral patterns and nothing on her feet. Hobbies: Yuki Hobbies include exploring, reading , writing, spying on the people in the world of the living, Gathering knowledge. Likes- Reading, Mediation , Going to the world of the living, Drinking, Attention from her espada leader. Personality: Mai is a soft-spoken girl with a heart of only the best intentions for anyone she meets. Around people she is Kind and as helpfully as she can possibly be, She is not shy a shy person but she does not like to stand out in the crowd either. When speaking she always makes direct eye contact and is never rude ( or tries not to be ). When in a fight she stays calm and tries her best to assess the situation and even trying to defuse the problem before fighting. Mai loves to be alone and when she is all she does is daydream and if not doing that she has her nose in a book. Around men she tends to shy away from them not really wanting to be noticed but somehow is anyway, she is an what some would call " a hopeless romantic ". She is not the seductive type but can play the part well if the need arises. Yuki was born into Japanese Royalty and a very well known medic as the Royal princess of her part of Japan. She was born beautiful, and lived beautifully. She was always waited on hand and foot, but was still raised to be a formidable fighter. She was always a flirt though, baiting the servants before having them killed for thinking impure thoughts about her. This feeling consumed her, having killed many of her servants when she was alive. She died during a raid on the castle, being skewered by a foot soldier's spear on accident. When she was a spirit, she held ill-will for those who killed her, and haunted the adjacent castle, filling it with dark energies, subsequently bringing hollows to the area. The people around the village were eaten, their souls creating more hollows. Soon, Shinigami were dispatched to the area to clean up the mess that Yuki had wrought. A hollow had already eaten her soul, and she had fed on other hollows, growing stronger each time. She retreated to Hueco Mundo after the Shinigami appeared. In Hueco Mundo, she became known as a princess, and a stunning one at that. Merciless and cruel, those were the words that went with her name. When she became an arrancar, she already had the power to become a fraccion right under the Espada. She became more beautiful than she was when she was living, gaining the nickname "Perfection". To this day, she still is a fraccion, but is steadily becoming stronger to surpass her title and become an espada.